If you type 'flat Earth' into Google, you'd be joining a group of people that have helped to triple the search term over the last couple of years. In fact, a recent YouGov poll found that only around two-thirds of Americans aged between 18 and 24 believe that the Earth is round. 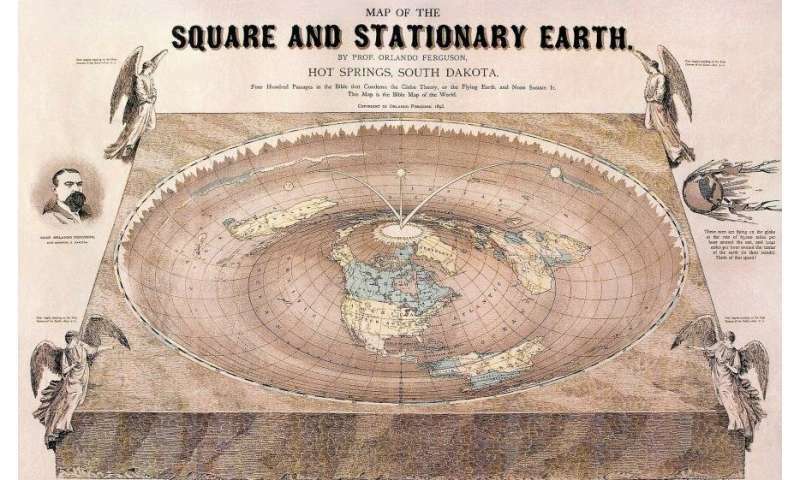 Although the idea the Earth is flat has been scientifically discredited, there seems to be a growing belief in the conspiracy theory. And it's getting more traction than some of the other conspiracies out there, like chemtrails (which proposes that a plane's long-lasting condensation trail is actually made up of chemical or biological agent). Interest in most of these other far-fetched theories remains stable but the flat-Earth movement is growing, particularly in America. And it has some high-profile supporters. From basketball players to musicians, rappers to TV hosts, a number of celebrities are jumping on the flat Earth bandwagon. So what's causing a renewed interest in something that's been scientifically disproven for the past two thousand years or more? What does it say about social media? And how did we actually establish that the world is round in the first place? Once upon a time, it made sense for people to believe that the Earth was flat, says University of Melbourne cartographer Chandra Jayasuriya. Ships would sail off toward the horizon and often never return, and those people left behind didn't really have access to information outside of their communities. "Their view was egocentric and geocentric. They lived in a village that was the centre of their existence,'' she says. "The further away from the village they travelled, the more hostile the environment became." Greek philosophers established that the Earth was round as far back as the third century BC, but it wasn't until the 15th century that it became commonly accepted. The first scientific estimates of the Earth's circumference were made by the Greek mathematician and geographer Eratosthenes in 240 BC. He noted that on the 21st of June that year, in a town called Syene (near modern day Aswan), the reflection of the sun could be seen in a deep well, meaning that it was directly overhead. But in Alexandria, around 800 kilometres away and almost directly north of Syene, at noon on the same day, the angle of the sun was about seven degrees – or one-50th of a circle. If the Earth was actually flat, the angle would be identical in both places. "From this, he concluded that the circumference of the Earth must be 50 times the distance between Syene and Alexandria," Ms Jayasuriya adds. "This gave him a figure that was very close to the actual circumference as we know it now." In 150 AD, Ptolemy's treatise Geographia laid out a revolutionary system of assigning co-ordinates, expressed in degrees of latitude and longitude, to locations around the world. The mathematician and astronomer assigned these coordinates to more than 8000 places across the known world. Even though many of the measurements weren't accurate, Ptolemy's concept of 'global mapping co-ordinates' – used to this day—was based on the theory that the Earth was and is, indeed, round. "Although Ptolemy's original map didn't survive, the text was rediscovered around 1300 AD and cartographers were able to recreate the map", says Ms Jayasuriya. 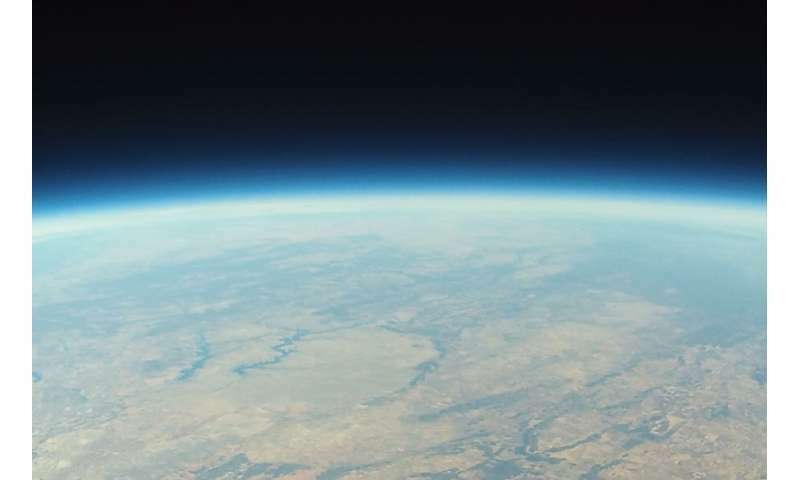 So why, despite overwhelming scientific evidence that the Earth is an "oblate spheroid" – a sphere that's squashed at its poles and swollen at the equator – is the flat-Earth movement gaining traction in the 21st century? Well, in part, according to School of Culture and Communication lecturer Dr. Jennifer Beckett, it's due to a general shift towards populism and a distrust in the views of experts and the mainstream media. "It's really about the power of knowledge, and that increasing distrust in what we once considered to be the gatekeepers of knowledge – like academics, scientific agencies, or the government," Dr. Beckett says. In this kind of environment, "it becomes really easy for once-fringe views to gain traction. You get a bunch of people around you who are constantly reaffirming your belief." Dr. Beckett also notes that the burgeoning movement speaks to how so-called social media "influencers" can now hold more sway than an expert in the field. "That's often because they tend to be better storytellers," Dr. Beckett says. "And there's an element of authenticity there – people naively think, 'Oh, they're a real person, so it must be true'." Dr. Beckett notes that the flat Earth community uses various social media platforms in distinct, overlapping ways in order to create a kind of ecosystem around their beliefs. "Youtube becomes a content hub, Facebook becomes an administrative one-stop shop for that hub, and Twitter continually pushing out the messaging," she says, likening Youtube to a sort of alternative documentary channel for flat earthers. "It's a really interesting beast … they can have their daily or weekly TV show in the same way that we go to David Attenborough." It's a more powerful social media tool than Facebook or Twitter because it's a "high context" platform, Dr. Beckett says, where users can stream themselves with an immediacy and intimacy that's lacking from text or image-based platforms. "It's kind of like feeling like you have direct access to David Attenborough, after watching one of his documentaries. Being able to have a conversation with him then have him respond in the next episode to your concerns or your question." And unlike TV, on Youtube you can go searching for videos by people who agree with your view of the world. Or in this case, the Earth. Dr. Beckett says that as we increasingly rely on social media for entertainment, we are becoming "affect addicts—looking for the next hit of anger, happiness or other intense emotions. And it's very easy for misinformation to circulate in this environment. Many flat earthers endorse the idea that the UN logo is actually a flat Earth map, for example. But Ms Jayasuriya adds its appearance is the result of a way of 'projecting' a 3-D sphere onto a 2-D plane. Because there's "no perfect way to project a 3-D sphere onto a 2-D surface", cartographers produce maps using different 'projections' for different uses. 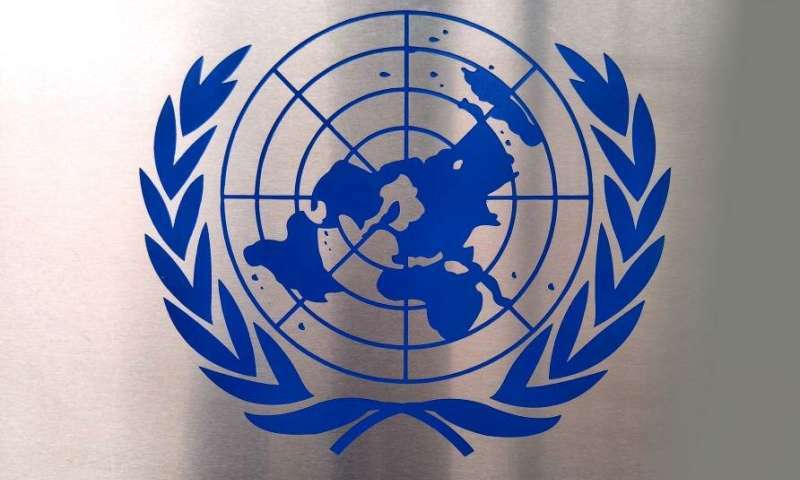 The UN logo is a particular projection centred on the North Pole. So, the question remains: why is this a theory that still persists in 2018 in the face of science, and even photographic evidence? Well, it also comes back to thinking critically about information that's out there. Particularly online. "Look, flat earthers' are actually employing Cartesian doubt; this a philosophical idea that the world outside the self is subject to uncertainty," Dr. Beckett says, referring to a method of sceptical thinking popularised by René Descartes, the French philosopher, mathematician, and scientist. "But, I'd say the best way to do your research on whether a story is correct is to actually go to the mainstream media, to go to those scientific agencies and see what they're saying. "Academics are academics not because they're trying to pull the wool over people's eyes, but because we spend a lot of time training and thinking deeply about these issues," says Dr. Beckett. "You know, a lot of time, work and effort has gone into perpetuating the notion that the Earth is a globe... perhaps, that's a sign that it is." 1/3 of Americans think the world is flat. what convinces you earth is a globe? You ca see curvature at that altitude, ya know. "Well, in part, according to School of Culture and Communication lecturer Dr. Jennifer Beckett, it's due to a general shift towards populism and a distrust in the views of experts and the mainstream media." I really don't see how that could be possible. Children spend 16 of their most formative years being indoctrinated by the public school system and higher education. Something has really gone wrong if they do not have 100% trust in the experts and main stream media. Don't worry they will soon fine tune the system so that no independent thoughts exist. "In fact, a recent YouGov poll found that only around two-thirds of Americans aged between 18 and 24 believe that the Earth is round." What more proof do you need? The US educational system is a total failure. But there is good news here, everyone got a participation trophy! To answer the question of the title of the article, ummm, because they're stupids. Eratosthenes showed the Earth is a globe in the third century BCE. The experiment he did is easily duplicated, considering it wasn't very sophisticated. Might take a while though. Amateur astronomers can measure this these days. It's not hard.